Ye may remember me beautiful gundog trainee LEXIE BELLE ON THE COBBLE, nearly white as a ghost with coal black features. Given that she is from primarily show stock lineage there was some initial doubt regarding her potential as a gundog. LEXIE is currently spending the hunting season with Scott and gaining practical experience in applying the many skills she developed in her early gundog training. LEXIE will continue with more advanced level gundog training in 2017 and will be campaigned in both HRC and AKC licensed hunt test events. Grand work by both LEXIE and Scott! Good work, Lexie! I think there have been a number of "show stock" huntin' dawgs on here. Too bad Pete and Satch aren't around to tell their tales of upland bird hunting, too! Wow! That is a large bird. How much does a goose like that typically weigh? 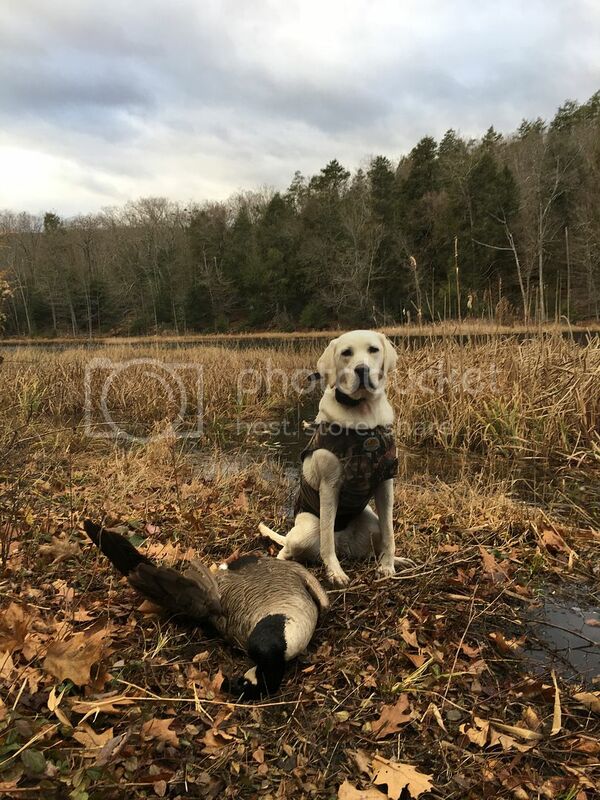 My dogs will never be gundogs, but I love reading (and seeing photos) about others' adventures. Thanks! Canada Geese can range in weight from a little over 6 lbs. to over 19 lbs. and their are several subspecies of varying sizes. Last edited by IRISHWISTLER; 12-06-2016 at 09:44 PM. That goose looks as big as Lexie!!!! Nice work and good to see the girls doing great work! Good work Lexie! Love seeing a lab doing everything they can do, in the ring or in the field. wow, that goose is almost as big as Lexie! good girl, shes getting to do ALL the fun stuff now!